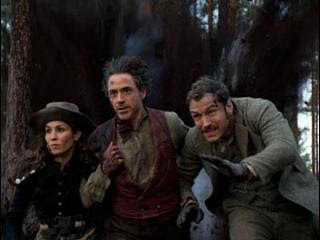 Director Guy Ritchie of the 2009 Sherlock Holmes once more infuses the film with the same manic non stop action that's attractive to the eye but boggles the brain. The beautiful detailed sets, the clever ornate costumes, the hyper wisecracking performances makes his Sherlock series almost claustrophobic and befuddling. It's just an excuse to see Robert Downey Jr and Jude Law play off each other with their signature snarky comic timing that's fun to watch while they battle the iconic villain Professor Moriarty. The year is 1891 and Watson is typing a story of his last adventure with Sherlock Holmes. Jared Harris play Moriarty the criminal mastermind that is Holmes intellectual equal who may be involved in the death of Crown Prince of Austria. Inspector Lestrade (Eddie Marsan) believes it to be suicide, but Holmes deduces it to be murder. The clues may be found in a underground gentleman's club so he takes Dr. Watson (Jude Law) to a supposed bachelor party while investigating the bigger puzzle. Watson realizes that the lack of his friends at the party means that Holmes completely forgot about throwing him a proper send off before his impending marriage the next morning. At the club Holmes meets Sim a Gypsy fortune teller (Noomi Rapace, the Swedish version Dragon Tattoo Lisbeth) who has somehow become the next target of the killer. Sim accepts Holmes help in finding her brother Renee who has disappeared. After Watson gets married to Mary (Kelly Reilly) they plan to honeymoon in Brighton. But Holmes is there dressed in drag while bad guys attempt to kill them. Naturally Watson is perturbed by the interruption to his night of bliss and is even more upset when Holmes throws her off the train into a river, nicely timed for her to be picked up by his brother Mycroft Holmes (Stephen Fry). Rachel McAdams is back as Irene Adler but she takes an early permanent exit. The story somehow involves anarchists, corporate espionage, a peace conference in Switzerland, weapons of mass destruction and a deadly chess game. It's all wrapped tightly in a kinetic slo mo action sequences that make the last thirty minutes of the movie worth wading through the first part. If you have seen the first Sherlock movie then you can expect pretty much the same treatment, just better effects and a better villain. Jared Harris is great sparring with Holmes and their chess game dialogue (screenplay by Michele Mulroney and Kieran Mulroney) bouncing back and forth is more exciting then all the explosions and gun play. Look for Stephen Fry as Holmes brother Mycroft to steal his scenes while poor Noomi is very underused left to running and dodging bullets. The best parts are Holmes experiments with camouflaged clothing. This latest venture into the Sherlock series takes one far and away from the Basil Rathbone stiff upper lip Holmes. This one delves into Holmes keen observation abilities and his ever clever disguises. Good mindless entertainment for the holiday season. But you probably won't be able to recall the plot in few months. :( underused Noomi Rapace. I'll be watching it this weekend and one of the reasons I considered watching it was to see her shine in another movie.